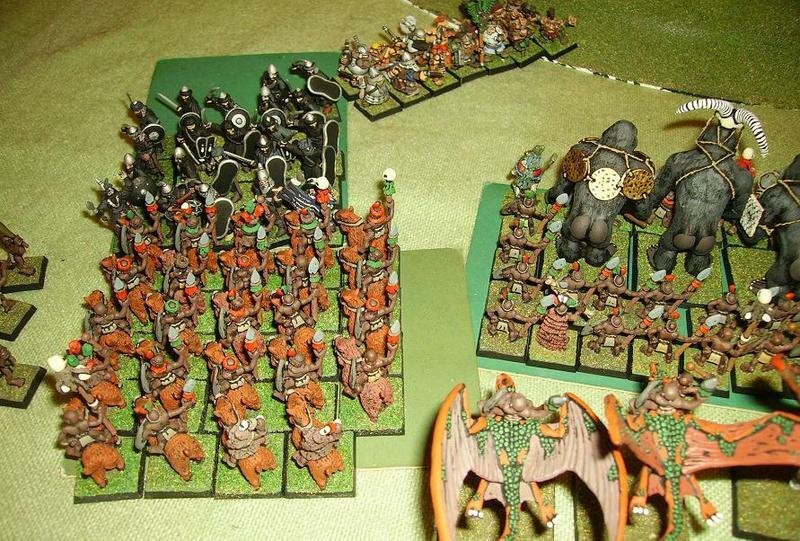 A unique Fantasy Battle Report with a Lizardmen / Pigmy army facing off against an Empire / Dogs of War army. "...the Pygmies’ Salamanders moved up on the far left flank, sulphurous fumes already curling from their throats and through their jagged teeth..."
the Padre returns with another one of his legendary reports with great photos, narrative and with Gorillagors (!) 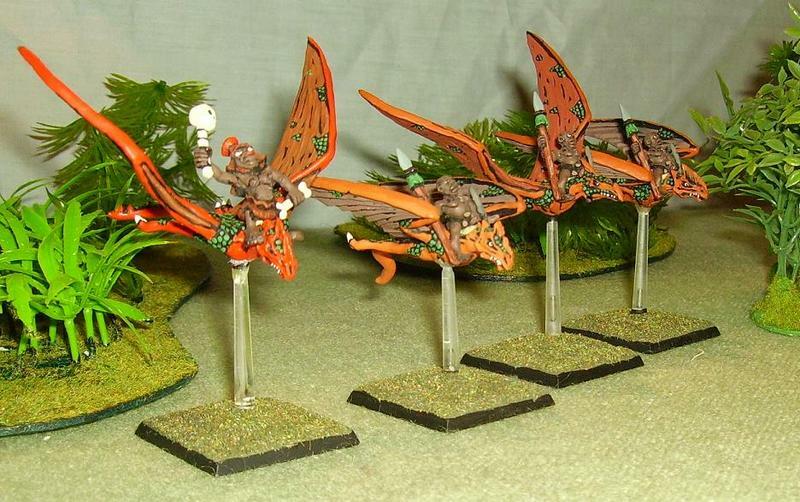 and pygmies on terradons ! Conrad was not unused to the heat – he had sailed along tropical coasts for many a year in search of prey and loot – but this was new. It was so damp, the air so still, like nothing he had ever had to endure aboard a ship. He was as sodden as every man in his force, and he knew full well that if they were to linger overlong in this swampland half of them would be dead of fever within two months. But such concerns, he now reckoned, were behind him, for he had found what he was after. It was a temple, obviously ancient and surely built by the lizardmen, and it looked undisturbed. If so, if no robbers had been there before him, then there must be riches inside, gold a plenty and worked artefacts covered in precious stones. These temples were renowned always to hold such things. 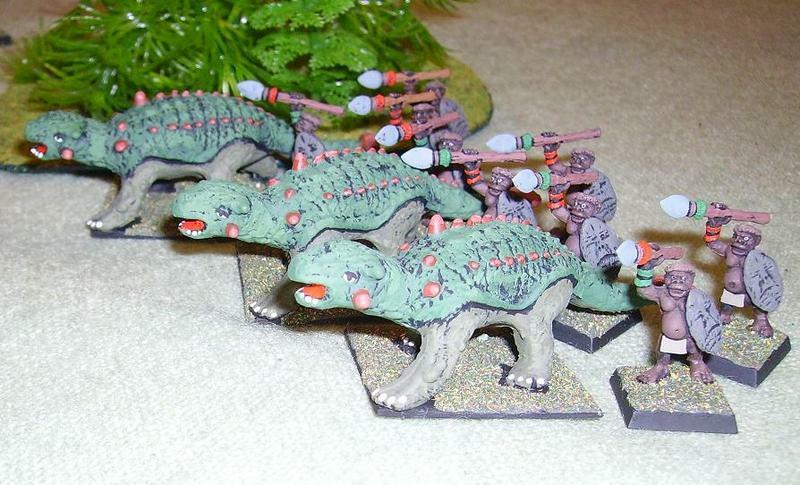 It had been long known that the ancient Lizardmen used gold as men of the Empire would use pewter or brass; used diamonds, rubies and emeralds as a Bretonnian brat might play with clay marbles. Of course his men had yet to break their way into the temple, but with powder and skill, that would be easy enough. He had ordered several of his gunners to fashion up fireworks, while the rest of his force busied themselves with cleaning their weapons, scouring the rust of their blades and greasing and oiling their handguns. On the journey the army’s matchcord had been kept dry in glass bottles, their locks rust free with tallow. Now the match was being distributed and the tallow wax removed, for Conrad was certain that the jungle would reveal some sort of defence force. He had heard enough sailors’ tales to known that although the settlements of the Lizardman might appear abandoned, jungle monsters always appeared when the looting began. Let them come, he thought. Let them face a firestorm of lead. His confidence was not unfounded. He had four companies of handgunners – Estalians, Pirates and Corsairs. He had crossbowmen and pistol wielding duellists. He even had two light cannons that had somehow been dragged through the steaming tangle of the jungle from the boats. On top of all this, Long Drong’s Slayers were apparently festooned with more firearms than the rest of his army put together, which was saying something. And this was not all. He had three fighting regiments, two of seamen regimented under pirate colours and one of the best Corsair Swordsmen Sartosa had to offer. And if all this proved insufficient, if the jungle hurled magical assaults at him, he had two wizards to divert and disperse its fury. Yes he was ready for monsters and jungle beasts. What he didn’t expect was what his scouts came to tell him. “I knew they would come. What are they?” asked Conrad. “Well, the beasts I expected, but halflings – I never thought … Still, send word to my commanders. We shall array upon the hill, facing the foe. Use the slopes and the steps of the temple to bring more guns to bear. They might be harder to hit if they are so small, both they will fall all the easier if they are hit. Concentrate the fire upon the monsters, once they are dispatched it shouldn’t be difficult to see off the halflings. 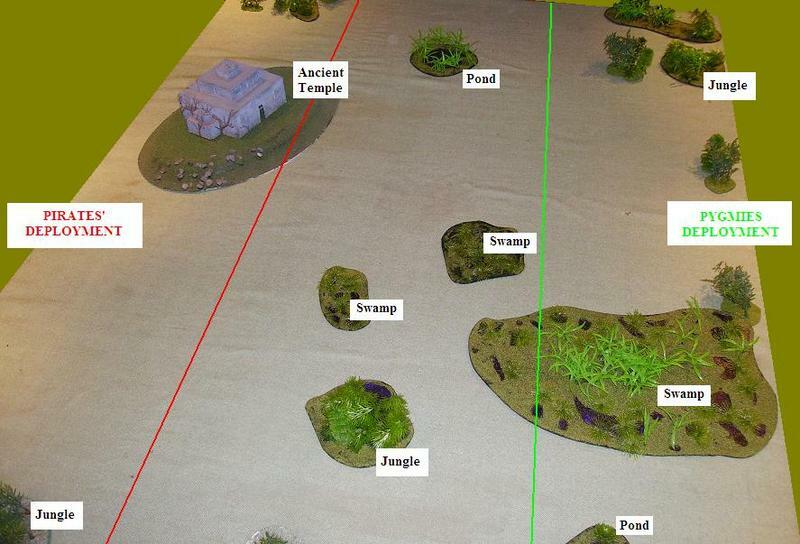 The field of battle would be the large clear area before the temple, swampy but at least clear of trees and the tallest of jungle plants. Conrad’s army was quick to form up. Every man knew he would get a share of the treasure, and what with that reward being so close, all were keen to see off any who thought to deny them their prize. 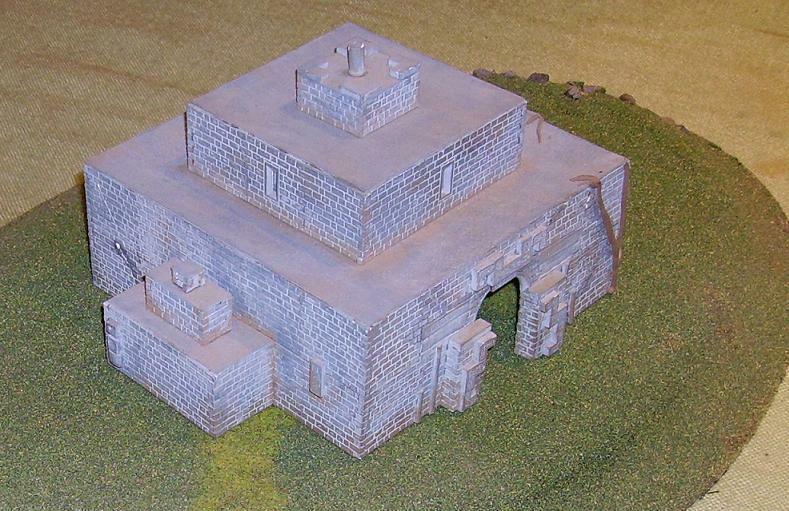 The handgunners and artillery positioned themselves obediently upon the hill and the temple, while the foot regiments took up positions upon the flank. On the far left the Corsair crossbowmen stood in an extended line, their colourful garb and copper adornments bright in the midday sun. Conrad joined the Black Swordsmen, his Sartosan elites, whilst shouting orders at all those around him telling them to load every weapon they had with extra powder and extra ball. Two or three balls went down every handgun, and swan shot besides. The great Skink Priest, Tehenhauin, had known now for three days that the men were getting closer to the temple. He and his two followers, the last of the Skinks to dwell in this almost forgotten corner of the land, had thus had time to prepare. All three of the local pygmy tribes, each of which considered him a living god, were ordered to muster. The northernmost brought their Terradons, which were the first to arrive. They were dispatched immediately to report on the enemy’s progress through the jungle. 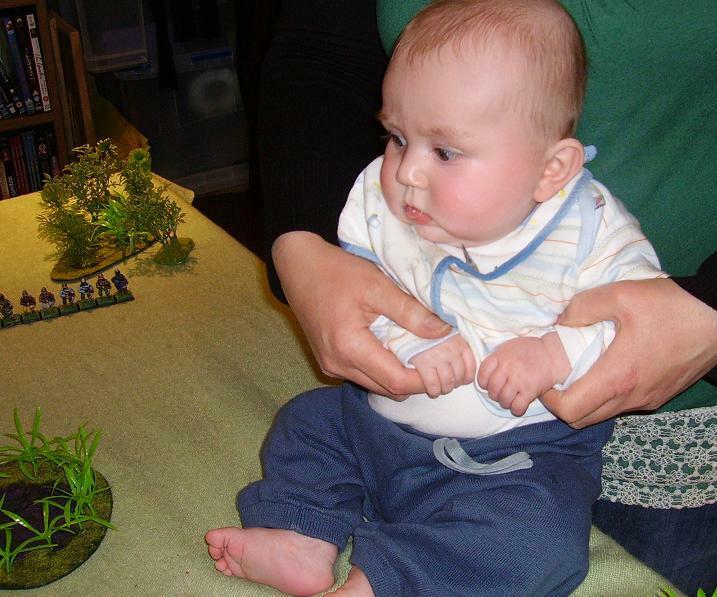 The other two tribes brought Salamanders, Gorillagors and a mighty Stegadon – the only one of it’s kind to dwell in this land for decades now. The Pygmies themselves came in large numbers, bringing either javelins and shields or blowpipes. Those with the former arrayed themselves in ranks and files around the giant gorillas. 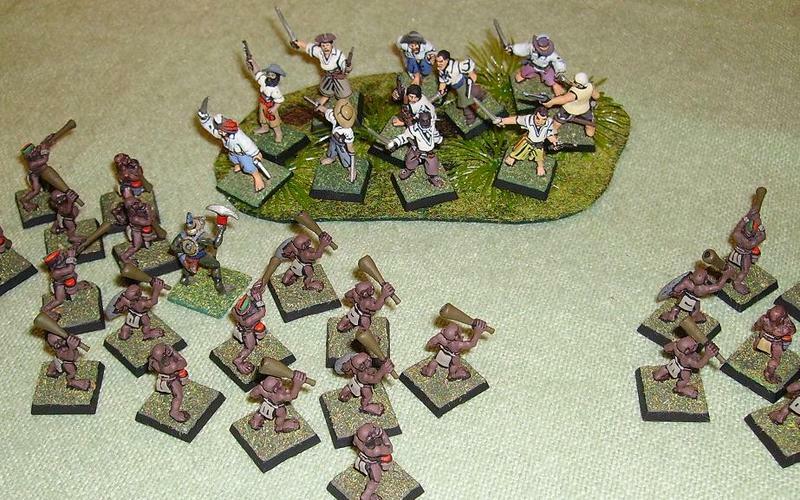 Those with deadly, poison tipped blow pipes made up two companies of skirmishers. The boar riding warriors, the strongest of all the pygmies, joined in one huge body, with the skull topped standards of all three tribes held aloft. The army moved as one forwards, with the three Skink chiefs amongst them (two with the skirmishes and Tehenhauin with the massed ranks of Pygmy shield warriors. Out to the far left of the line the four Terradons flew low through the jungle trees, each mounted pygmy clutching a woven net of vines filled with rocks. By means of a shrill cry, Tehenhauin gave the signal to his army to advance. This they did, answering his cry with strange warbling wails of their own, accompanied by the growling of the Salamanders and the rumbling roar of the Stegadon. The rightmost skirmishers moved into the little swamp ahead of them, thinking to benefit momentarily from the concealment it afforded; while the leftmost band moved as far as they could. Both harboured the skink priests, Tehenhauin’s lieutenants, who prepared to cast their spells as best they could. Much of what they brought into being, however, was dismissed by the enemy’s counter magic, but the lightning bolts conjured by the Rod of the Storm tore down successfully to slay four of the Handgunners massed on the temple. Perhaps the ancient gods were angered by the sacrilege of the Pirates’ mere presence in such a holy place. … though some say there is a power behind the pygmy gods, an even greater being who truly rules the world of pygmies and (wargaming) men. She is the earth mother, and her will must be obeyed, though her commands are softly spoken. Conrad was not dismayed by the manifestation of magic – to be honest he had feared much worse might be summoned into being. His Estalian Handgunners now moved down the hill so that the Maroon Hangunners behind them would have a clear line of sight. The Dwarfen Slayers moved as best they could forwards, while Conrad and the Black Swordsmen kept in line with their flank. The Duellists advanced towards the skirmishers, as yet unable to work out what exactly the enemy was armed with, and as such not exactly confident of their prospects. The lesser of the two wizards moved down to join the Maroon Handgunners, realising that should the lightning strike again it could be the end of both Conrad’s magic users. As this cautious move was made, the wizard was suddenly deafened by two thunderous blasts, one upon either side of him. Both cannons had misfired disastrously, both exploding into pieces, the sound of their demise doubled in strength by rebounding off the stone walls of the temple behind them. As the smoke rolled outwards and the sound died, every man upon the hill discovered his ears were ringing from the blast. Though compared to the mangled remains of the cannon crews, they thought they had got off light! Conrad winced when he realised what had happened. After all his precautions to make sure that his gunpowder weapons would be ready for battle, to have both his artillery pieces break apart upon their first firing seemed more than bad luck. The hill must indeed be cursed by the jungle gods! On the far left of the Pirates’ line the Corsair Crossbowmen managed to wound the Stegadon with a veritable hail of bolts, while the Handgunners upon the temple killed only one Pygmy. The shock of the exploding cannons right nest to them seemed to have seriously distracted the wizards, for neither could bring their magic into being. A palpable unease was coursing through the Pirates’ lines. Ahead of them the jungle army came on. 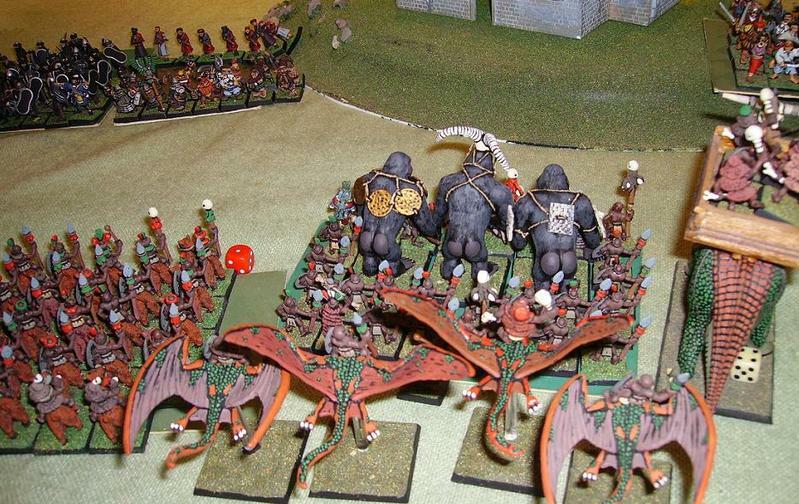 The huge body of Pygmy Warriors and Gorillagors, joined at their side by the Stegadon, charged at the Estalians who had foolishly moved into range by advancing down the hill. Entirely uncertain of themselves, the Estalians elected to flee from the sudden onslaught – maybe they thought to draw the enemy into range of the dwarfs. But their flight proved disastrous, for as they ran through the Marooners they broke them too, and both companies poured around and over the temple to began their descent upon the rear side of the hill! As this collapse in the centre of the Pirates’ line occurred, the Pygmies’ Salamanders moved up on the far left flank, sulphurous fumes already curling from their throats and through their jagged teeth. Nine brave warriors jabbed at the beasts from behind, nudging and prodding them in the desired direction. 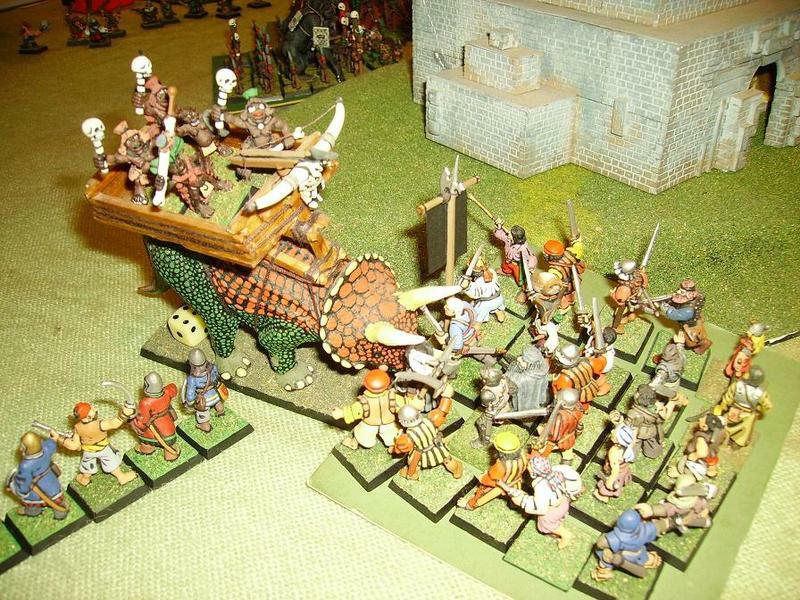 The Pygmy Boar Riders (AKA Saurus!) advanced to the left of the Pygmy cohort that had failed to reach the enemy, in order to protect its flank. Behind the same unit, the Terradons settled down - eyeing the pirates still mustered upon the temple and considering whether to direct their next move against them. Gobbling down Ixtli grubs to bolster his magic, one Skink Priest attempted to summon the lightning once more but despite his diet failed. Tehenhuain was more certain in his magical manipulations, and cast the Wolf’s Hunt on the Stegadon, sending the huge beast into the massed Pirate free company ahead of it. Panicked by the sudden and terrifyingly fleet motion of the monster, these pirates joined in the Handgunners’ flight. The last of the Skink Priests, spotting the enemy Wizard Lord still standing upon the higher levels of the temple, attempted to employ the Blood Statuette of Spite upon him, but the salty sea dog of a conjurer proved too resilient to succumb to it’s harmful effects. Now came the chance of the skirmishing Pygmies, the two companies totalling thirty one in number, to send a rain of poison tipped darts at the foe. Five Black Swordsmen tumbled to the ground. Then came the Salamanders’ turn to play their own terrible tricks. Six of the Pirate Free Company on the far right flank of Conrad’s line were slain by the fiery blasts, and like their kin on the other flank, their hearts proved to be wanting in courage. They fled, rushing through the Black Swordsmen and their detachment of Handgunners. At least under Conrad’s stern command these two units stood their ground. It seemed to Conrad now that none of his men would stand against this foe. He could not quite believe that he had only an hour before wondered whether halflings, even this strange Lustrian variety, could put up a fight of any kind. Yet apparently they were better warriors than almost all the men he had brought with him. Following the Wizard Lord’s example, the Pirate Handgunners atop the temple refused to be cowed by the proximity of the Stegadon. Elsewhere, faced with almost certain demise in the frightening jungles of this sweltering realm, every unit but one in Conrad’s army rallied, as if coming to their senses and suddenly realising that their only chance was to stick together and fight as one. Only the Estalians were dazed enough to continue their flight. Better still, the Black Swordsmen charged the Boar Riders ahead of them, just managing to contact the foe. Finally, the Pirates had launched an attack of their own. Perhaps this would prove to be their salvation, for surely their diminutive foes could not withstand full-grown men in battle? The Duellists were not so sure, however, and chose caution over any bold move. They ran forwards, yes, but only in an attempt to find cover in the little swamp ahead of them. Perhaps from there they could fire their pistols and see off the primitive foe with novelty of such modern weapons? The Pirates’ magic users failed once more to harm the foe with magic, the lesser wizard even having to use a dispel scroll to prevent an enemy spell the fumbling Wizard Lord brought into being. This land seemed only to favour the magic of its favoured inhabitants. 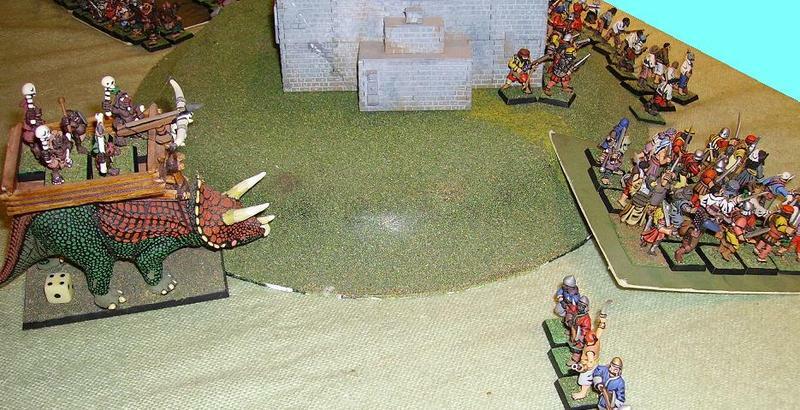 A handful of Pygmies now died from bullet wounds, while a Terradon fell to a crossbow bolt. None of the jungle warriors, however, felt an urge to flee as a consequence. It was clear they shared a resolve rather stronger than that of their foes. 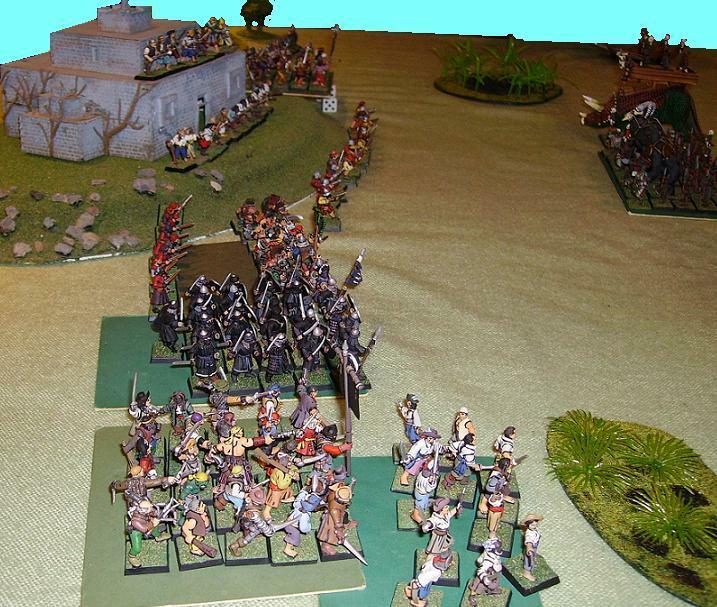 While the Pirates began reloading, the fight between the Swordsmen and Boar Riders bloodily unfolded. Yet even here, however, the jungle warriors proved hardy in battle, for neither side broke, and the fight went on. Frustrated by their previous failed attempt to close upon the enemy, the Pygmy cohort and their Gorillagors charged into the Dwarfen Slayers, rushing through the leaden bullets unleashed as they closed and crashing into the foe with glee. Tehenhuain himself led this company, as well as a Pygmy Chief, the most respected warrior of all three tribes. 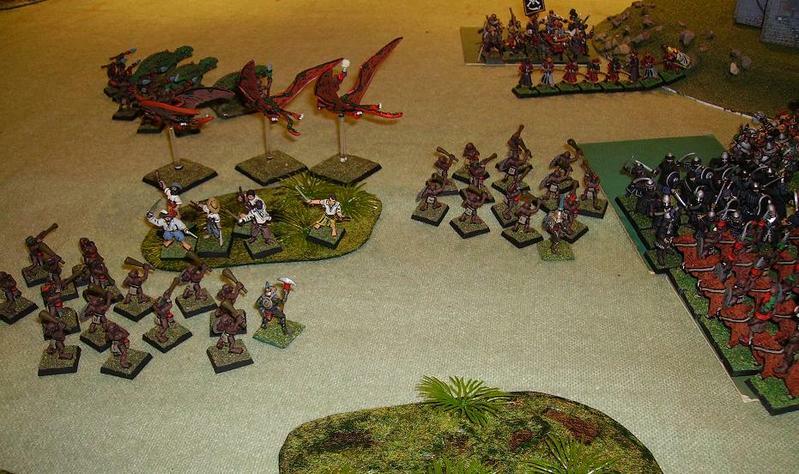 At the same moment, upon the Pygmy right flank, the Stegadon charged the now rallied Pirate Free Company once again. This time they stood to take the charge, bracing themselves as best they could for the mighty impact of the beast. The Terradons chose not to move against the Handgunners on the temple, but instead flew over the swamp containing the Duellists, dropping their burden of rocks as they did so to kill five of the pistol-wielding pirates. 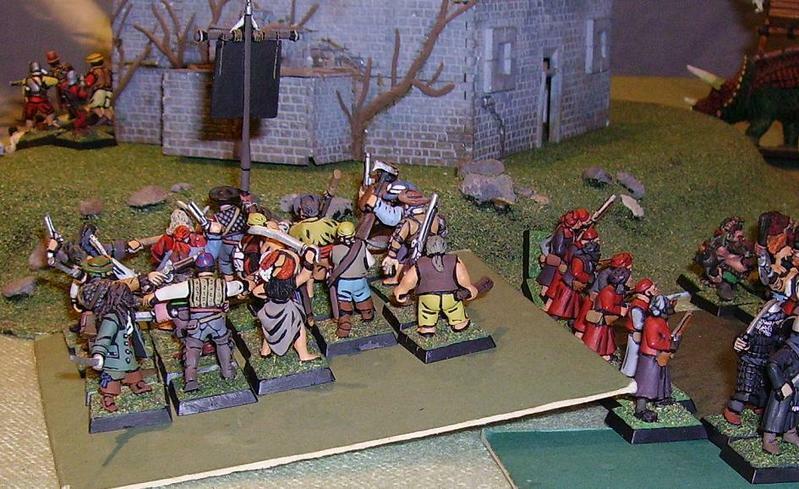 The Pygmy skirmishers, deciding they were unafraid of the Duellists, decided to separate – one group going off towards the enemy centre, the other standing their ground ready to calmly dispatch the Duellists. When they shot their darts, four more Duellists collapsed to slide beneath the murky waters of the swamp. This proved too much for the last Duellist, who fled the field in anguish never to be seen again! Tehenhuain knew what he must do, and conjured up the Bear’s Anger, directing its effect upon the Pygmy Chief in his own unit. The little warrior would be transformed into a ferocious and deceptively mighty fighter. The Boar Riders hacked and slashed at their foes, this time slaying two of the black garbed Corsairs, who in response seemed unable to harm the pygmies or their boars. Now it was Conrad’s turn to do as much of the rest of his army had done – to turn and flee. The Boar Riders couldn’t catch them, but they overran into the Slayer’s flank in their fury, and turned a bad situation into a worse one for the Long Drong’s bearded buccaneers. To make an awful situation about as bad as it could be, the newly rallied Free Company were somewhat disheartened by their general’s flight (he passed right through them) and for the second time they too took to their heels. 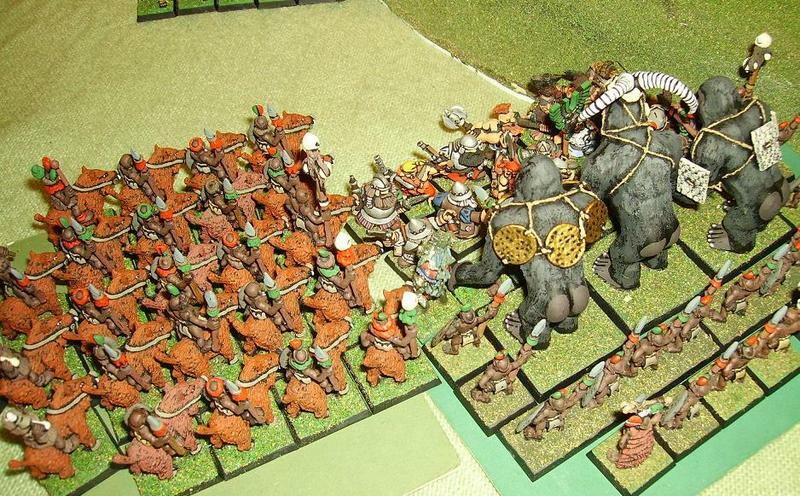 In the centre of the field, the two large units of Pygmies began the bloody work of slaying Slayers. Ten Dwarfs fell in total, some to Tehenhuain’s snakes, others torn in two by Gorillagors, still others pierced by stone tipped spears. Several fell to the wild Pygmy Chief, his magically induced fury proving almost unstoppable. Only Long Drong and three of his warriors remained. He knew full well that he would perish with the last of his loyal band within next few moments. Out on the Pygmies’ right flank, the Pirate Free Company somehow found it in them to make a stand against the Stegadon, and through sheer weight of numbers they held their ground. The Stegadon was beaten in combat, but knew no fear and fought stubbornly on. Five Pirates had been trampled underfoot. Now (at the end of turn 3) the Pirates knew full well that their cause was hopeless. Conrad and his Swordsmen were running. Long Drong was certain to fall to the massed ranks of Pygmies and monsters all around him. 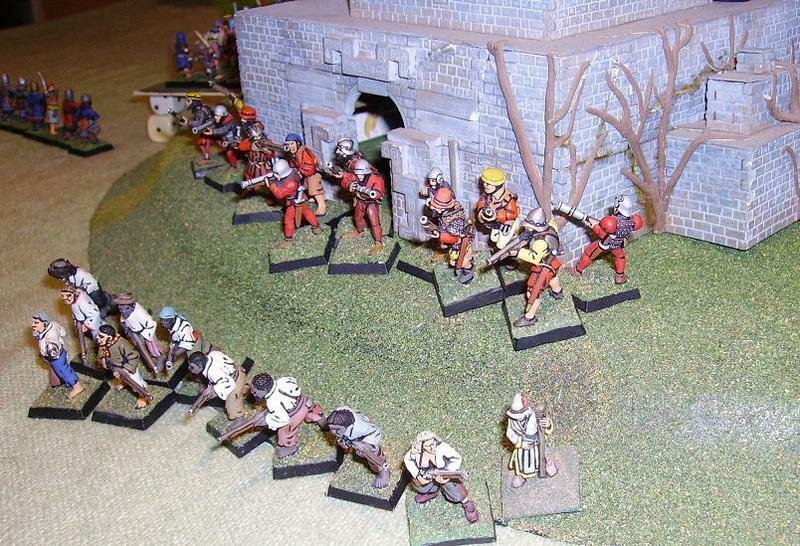 Virtually no Handgunners were left to fire any kind of volley, and one Free Company was running pell-mell away from the field, all cohesion lost from their formation. 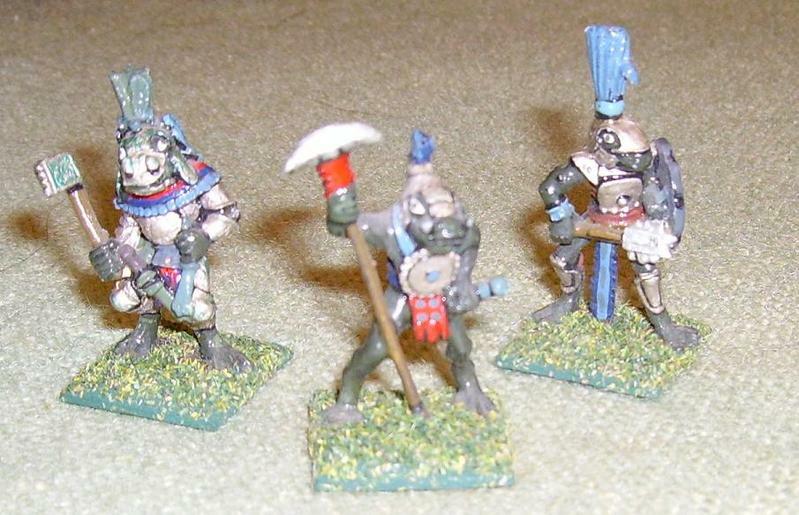 In contrast, only a mere handful of brave Pygmies lay dead or wounded, and all three Skink Priest could be seen preparing for their next magical assault. The battle was all but over. Conrad would be lucky to return to his ship, never mind take any gold with him. NB: The pirate army was mostly Empire in composition, but with DoW cannons (more appropriate), as well as Duellists and Long Drongs’ Slayers as Special and rare choices to make a convincingly ‘fluffy’ force.